Findings from the first two phases of the Effective Camp Project are published in the Journal of Youth Development. The article can be accessed here: The Fundamental Characteristics and Unique Outcomes of Christian Summer Camp Experiences. The Effective Camp Research Project set out to answer: What is the impact of the one-week summer camp experience on the lives of the primary participants and their supporting networks? The project began in summer 2015 at 3 camps in Wisconsin, using the methodology of grounded theory in order to deeply listen to campers, parents, directors, summer staff members, and area church professionals. It was from this deeply embedded research that we uncovered what we call the 5 fundamental characteristics of Christian summer camp: safe, participatory, relational, away from home, and faith-centered. Following the initial research, we began surveying summer campers on the first day, last day, and 2 months following camp to determine growth and lasting impact. 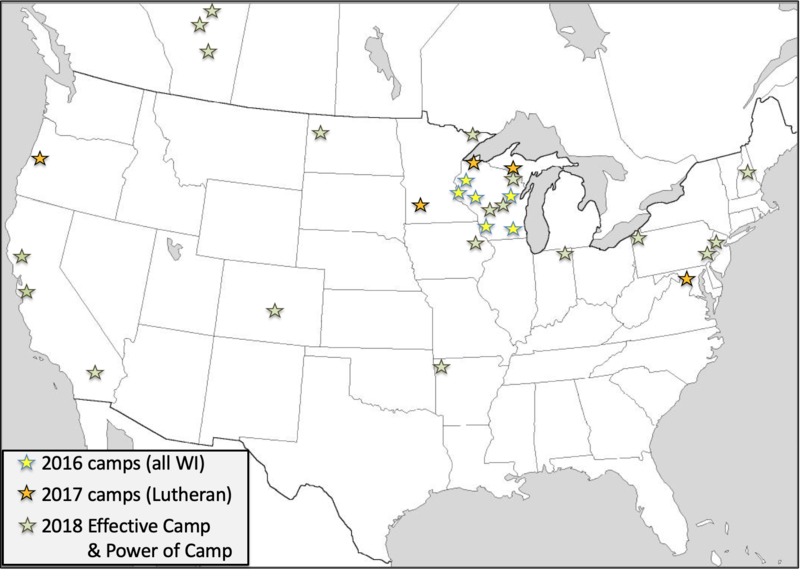 We have now surveyed more than 5000 campers at 30 camps in 13 states and in Canada. It turns out that some effects of the camp experience tend to wear off in the weeks following camp, but there is compelling evidence for lasting change in several camp outcomes. Knowing how your camp is doing when it comes to these lasting outcomes can help you improve your programs, motivate your constituency, and strengthen your partnerships with congregations and families. Learn more here if you’d like the ECRP Research Team to conduct research at your camp, providing you with valuable learning about your context, and offering a greater data set to the overall project. This four-page document sums up the important learnings from the first phase of the research. Read the Full Report, a 21-page PDF detailing the key findings from the initial phase of the research project. The data suggest that the positive impacts of camp result from a dynamic interplay of five characteristics that can be considered fundamental to the camp model of these three camps. It is notable that a breakdown in one of the five characteristics seems to constitute a breakdown in the model itself, leading to interpretation of the experience as negative or even harmful. These five characteristics have no set order, and they manifest differently in various contexts. The camp model may look very different from camp to camp, from week to week at the same camp, and even from person to person within a single camp group. Context and individual experiences matter. There is tremendous and almost unshakeable buy-in to the camp model among the camp faithful who have witnessed or experienced the impacts. There is also a clear preference for the specific way an individual experienced the camp model. This can lead to a narrow view of what qualifies as camp or the notion that a specific camp is better than all others. These data counter that claim, instead suggesting a highly adaptive model that functions in a space where all five characteristics are present. The entire camp experience is framed in an intensely relational environment that includes living together, meeting new people, practicing reconciliation, and encountering the other in face-to-face interaction. The potential impacts of this characteristic include improved social competency, increased self-confidence, and more positive attitudes toward Christian communities. The camp environment emphasizes experience and agency. Participants learn and grow through active, kinesthetic activities. These experiences are multi-sensory and often include new or novel experiences (especially in the outdoors) that participants characterize as fun. Participants even characterized the absence of technological devices as a positive aspect of camp that facilitated participatory encounter. The potential impacts of this characteristic include willingness to try new things, increased creativity, and more positive attitudes toward life. The strong sense of safety at camp includes physical safety, but there is a special emphasis on emotional safety. Participants described camp as a place where they could be themselves without fear of judgment or ridicule. The potential impacts of this characteristic that manifest themselves in the data include more positive self-understanding, increased self-esteem, and a desire to seek out safe places and relationships. Faith teachings and practices are not peripheral or intermittent aspects of the camp experience but rather are experienced as intertwined in all other characteristics. The potential impacts of this characteristic include increased frequency of faith practices in the home, stronger identification with faith traditions, and ability to interpret life through the lens of faith. 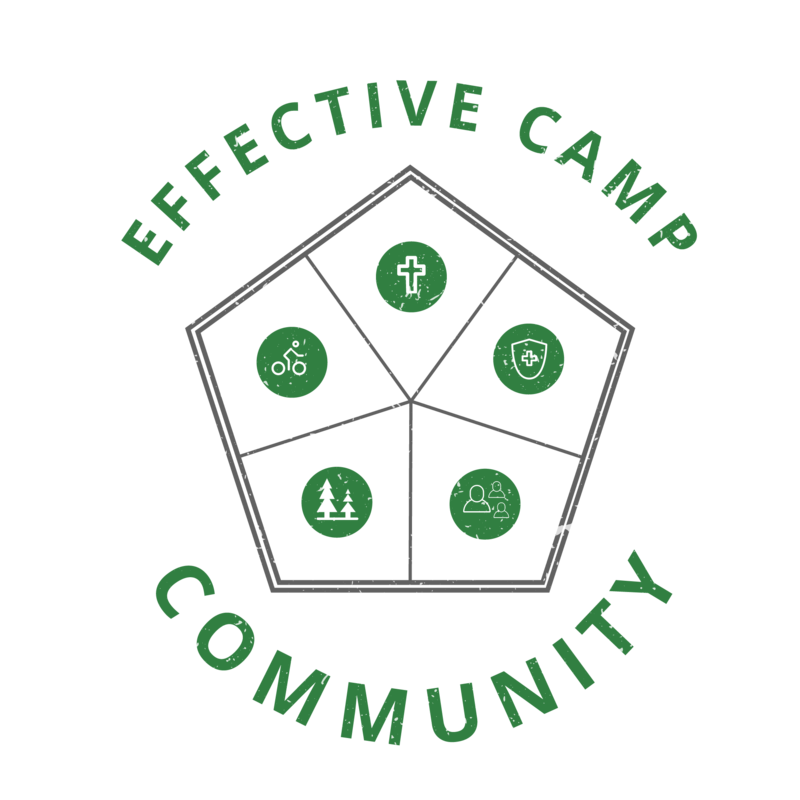 Below you’ll find your easy button on things to share about effective camp. These graphics and written statements help you tell the story of camps like yours and the depth of impact your ministry can offer in partnership with churches and families. The images are downloadable just by clicking. They are sized ideally for Facebook, work great in Instagram and Twitter, and can be embedded in your websites and emails as well. We’ll connect you with a team member that conducted the research to learn more about the project and its findings. Send us a message to get started, and we’ll be in touch. We’re gathering on via a special Facebook group to explore ideas, share resources, and tell stories of impact and tranformation through camp experiences.